Counting down the days to Christmas is nothing short of thrilling for a child — but ticking away the days with a disposable Advent calendar is no way to pass the time! Instead, observe the path to the 25th with this green spin on the Advent calendar from Etsy shop Nuvonova. A brilliant tradition to add to every eco-friendly family’s holiday repertoire, these reusable Advent calendar pouches are handmade with 100% unbleached cotton fabric. Each bag is printed with the days of December 1-24, and is perfectly sized for holding special treats and trinkets on the trail to Christmas! Font and color preferences, as well as ribbon color may be customized. *Note: Although we have missed the cutoff date for guaranteed December 1st delivery of this Advent calendar, the designer promises to ship it to recipients ASAP. Counting down the days to Christmas is nothing short of thrilling for a child -- but ticking away the days with a disposable Advent calendar is no way to pass the time! Instead, observe the path to the 25th with this green spin on the Advent calendar from Etsy shop Nuvonova. 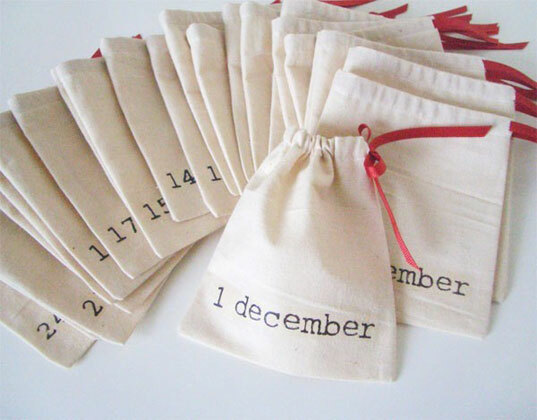 A brilliant tradition to add to every eco-friendly family's holiday repertoire, these reusable Advent calendar pouches are handmade with 100% unbleached cotton fabric. Each bag is printed with the days of December 1-24, and is perfectly sized for holding special treats and trinkets on the trail to Christmas! Font and color preferences, as well as ribbon color may be customized. *Note: Although we have missed the cutoff date for guaranteed December 1st delivery of this Advent calendar, the designer promises to ship it to recipients ASAP.